In response to the disastrous 7.1-magnitude earthquake in Qinghai province of China, a special limited ninja outfit, the Rescue Team Uniform has been released by Ninja Saga. 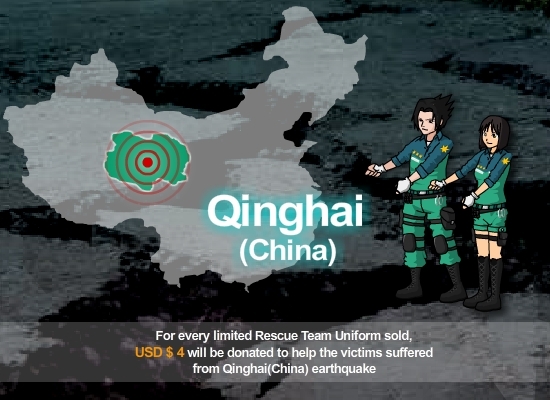 For every uniform sold, Ninja Saga is going to donate USD$4 to help the affected people. Over 100,000 people are affected by the horrible earthquake – roads are collapsed, buildings are torn, people are fighting to survive with horrible sanitation, and no food and water supply! Immediate help is needed – find the pink icon next to the special outfits in the Shop, click “BUY”, and you are saving a real life! Starting today, Ninja Saga is running a fund-raising campaign for the Haiti earthquake. Players can now help the earthquake victims by purchasing the limited edition ninja outfits, the Haiti Rescue Team Uniform (male) and the Haiti Medical Team Uniform (female) with 400 Saga Tokens – for every Rescue Team & Medical Team Uniform sold, $4USD will be donated to help earthquake survivors in Haiti. Find the little pink icon next to the special outfits in the Shop, click “BUY”, and you are saving a real life!